Why are cockpit instruments white on black dials? Which is easier to read: white on a black dial or black on a white dial? It would seem most aviation instruments are white on black. Right instrument face colors are inverted. When placed next to each other, they create the strongest contrast for those particular two colors. The red is used for easier adaptation to the outside at night. Too much glow in either case goes against that. As for digital displays, the same principle applies. Try reading an eBook in bed with the background white and the brightness to full -- it's very tiring -- that's why eBook readers have a night option where the colors are inverted. 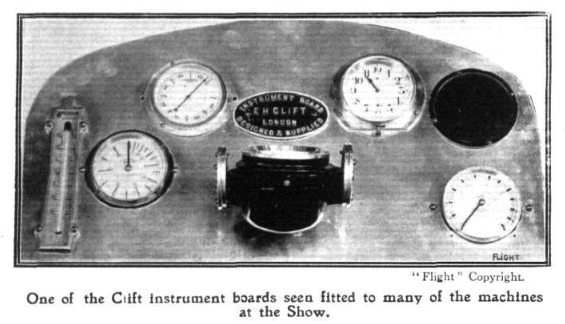 The panel itself (...) is first anodised and then stove-enamelled a dull black -- though it may be said that the matt-grey anodic finish is very much better looking than the black panel and does not reflect light or in any way trouble the eyes of the pilot. For night flying the white on black scheme emits probably 1 or 2% of the light that a black on white display does. This will make a very significant difference in cockpit light levels and night vision. While lighting levels could be turned down on the black on white displays the contrast would suffer. With white on black the lighting levels can be left relatively high, the contrast will be improved and pupil contraction will be less when looking at the instruments. Not the answer you're looking for? Browse other questions tagged flight-instruments cockpit human-factors or ask your own question. Can St. Elmo's Fire cause instruments to fail? Why are Airbus captain control sticks placed on the left when most people are right-handed? Why are the cockpit windshields on the A350 black? How can pilots lacking instruments interpret vectors given by ATC?